Sri City, August 9, 2017:- Deputy Inspector General of Police, Ananthapur Range, Mr. J. Prabhakar Rao, IPS, visited Sri City on Wednesday. 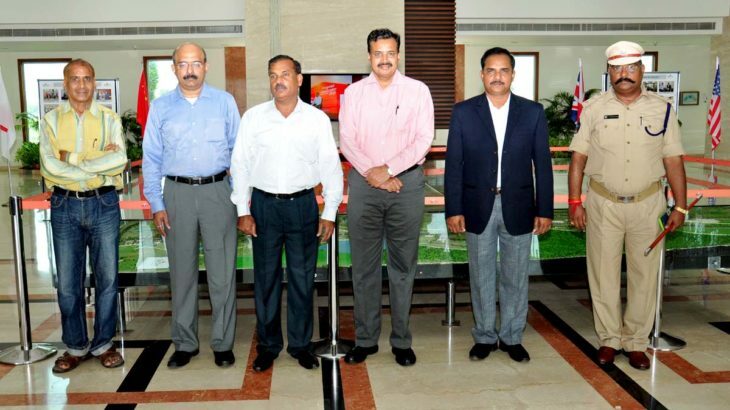 Mr. R. Nagarajan, CFO, Sri City extended a warm welcome and briefed him on the world class infrastructure, unique features and industrial progress of Sri City. Mr. Shaikh Altaf, General Manager, Security & Vigilance briefed on the security procedures in vogue. During the discussion with the officials of Sri City, he reviewed the status and assured to speed up the setting up of Hitech police station. Following the briefing session, he went round the mega industrial park and visited the production units of Isuzu, Alstom and Mondelez. The DIG was accompanied by Dr. M Kantharao, IPS, IG, Red Sanders Anti Smuggling task force. Mr. I. Nagabhushana Rao, DSP, Puttur was also present during the visit.